Santa Maria police evacuated the lobby of their own station on Monday after an Arroyo Grande man arrived with a suspicious package that contained a powdery substance. Joseph Skoda, an Arroyo Grande resident and United States Air Force veteran, opened his P.O. box in Pismo Beach and found a package containing a letter that had a white substance inside. The return address on the letter was in Santa Maria. Skoda took the package to the Santa Maria Police Department, prompting a response from the Santa Barbara County hazmat team, Santa Maria fire personnel and the FBI. Hazmat and fire personnel determined the item was packaged in a manner that did not pose an immediate risk to the public, according to the Santa Maria Police Department. Investigators identified the sender of the package and interviewed the individual, as well as Skoda. Authorities determined Skoda was indeed the intended recipient of the package. Santa Maria police say the package contained small items of military memorabilia wrapped in bubble wrap and tissue paper to protect them while in the mail. Police suggested that, in light of recent events in the country involving suspicious packages, they needed to take the incident seriously. “Fortunately this incident turned out to be a case of mistaken suspicion and hyper vigilance,” the police department stated in a press release. 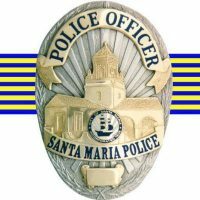 The Santa Maria Police Department instructs members of the public, in the case of encountering a suspicious package or powder substance, to leave the item where it is, evacuate the area and call 911. Next → Next post: Is SLO County continuing slight of hand over Paso Roble water basin?